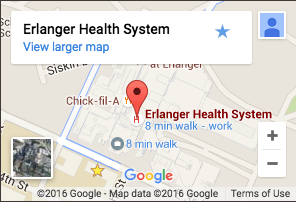 Children’s Hospital at Erlanger is proud to announce the new Kennedy Outpatient Center is now open. The Kennedy Outpatient Center was designed with input from patients and their families to improve every aspect of the medical visit. The kids will love the steam engine out front, the train in the lobby, the discovery zones, and even a café with frozen yogurt. Parents will love the drive up complimentary valet parking, self check-in and payment kiosks and local artwork throughout the building. Discover how our new outpatient center re-imagines children’s health care at its best. Watch this tour filmed during the grand opening. View 360° images of a few of the important spaces within the new outpatient center. NOTE: Enter parking lot from Palmetto St.